Will Increasing Minimum Wage Reduce Entry Level Jobs in Restaurants? There is talk that an increase in minimum wage will cost entry level jobs for the restaurant industry. Learn more in the following post. … the minimum wage mean fewer entry-level jobs. With a shortage of entry level work nationwide recognized recently by Hillary Clinton, CRA urges people not to reduce jobs even more with higher minimum wage demands. If you’re currently searching for entry level jobs, learn about some of the best and worst ones according to the following post. Young businessman in office searching for a job with mobile device. Photo courtesy of Shutterstock. While job seekers may one day dream about reaching the top of their chosen professions, keep in mind that we all must start somewhere. 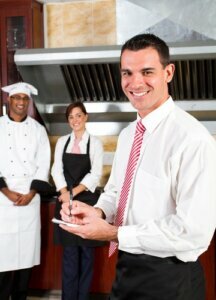 In the following post, learn how entry level jobs are beneficial to your career. Many of you soon-to-be college graduates are just starting your job search, and you’re probably looking at LinkedIn postings for mid-level management position on LinkedIn with visions of cool-sounding titles – and big paychecks – dancing in your head. This is totally normal… I had the same “first job” fantasies myself. But what I got was even better: a series of entry-level jobs. Don’t roll your eyes just yet.